The present confrontation in Congress involving immigration highlights how Americans perceive changes in the ethnic and racial makeup of the country. Two researchers carried out some experiments by interviewing white Americans about ethnic-racial diversity. They selectively brought up demographic trends in which non-white population will continue to grow relatively to white. They found “compelling evidence” that raising the shifting U.S. racial demographics, even well in the future, leads white Americans to perceive greater threat to their racial group’s status, which motivates them to increase their support of a variety of conservative policy positions. They also wrote that making this demographic shift salient for black Americans may result in group-status threat and shifts in endorsement of conservative ideology similar to those found among white respondents. Pew Research says that by 2055, the U.S. will not have a single racial or ethnic majority. Much of this change has been (and will be) driven by immigration. 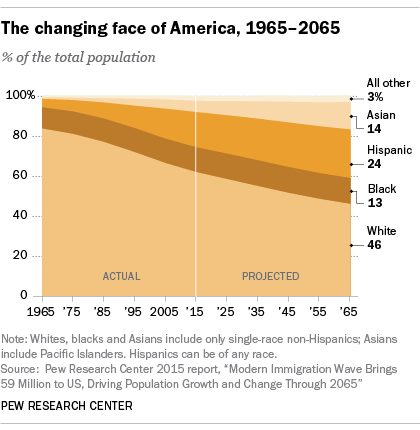 Over the next five decades, the majority of U.S. population growth is projected to be linked to new Asian and Hispanic immigration. This entry was posted on Monday, January 22nd, 2018 at 12:51 pm	and is filed under Demographics, Uncategorized. You can follow any responses to this entry through the RSS 2.0 feed. You can leave a response, or trackback from your own site.